Recently, a research team led by Professor Kejian Wang from China National Rice Research Institute (CNRRI) of Chinese Academy of Agricultural Sciences (CAAS) published a paper entitled Clonal seeds from hybrid rice by simultaneous genome engineering of meiosis and fertilization genes on Journal of Nature Biotechnology. This finding revealed that hybrids can be self-pollinated to produce true-breeding progeny through seeds by targeted editing of four endogenous genes in a rice F1 hybrid variety. Heterosis, or hybrid vigor, is exploited by breeders to produce elite high-yielding crop lines, but beneficial phenotypes are lost in subsequent generations owing to genetic segregation. Clonal propagation through seeds would enable self-propagation of F1 hybrids. This study reported a strategy to enable clonal reproduction of F1 rice hybrids through seeds. The researchers fixed the heterozygosity of F1 hybrid rice by multiplex CRISPR–Cas9 genome editing of the REC8, PAIR1 and OSD1 meiotic genes to produce clonal diploid gametes and tetraploid seeds. Next, they demonstrated that editing the MATRILINEAL (MTL) gene (involved in fertilization) could induce formation of haploid seeds in hybrid rice. 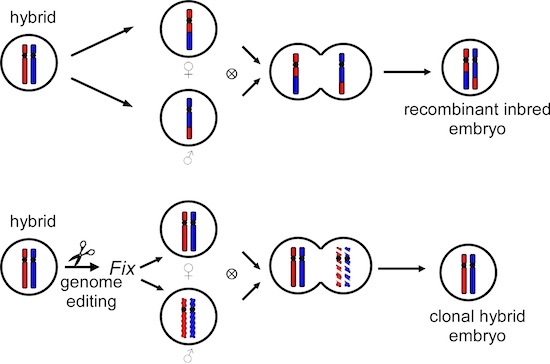 Finally, they combined fixation of heterozygosity and haploid induction by simultaneous editing of all four genes (REC8, PAIR1, OSD1 and MTL) in hybrid rice and obtained plants that could propagate clonally through seeds. Application of this method may enable self-propagation of a broad range of elite F1 hybrid crops.